City Hall, known as The People’s Committee Building of Ho Chi Minhlocated at one end of Nguyen Hue Street, one of the most beautiful streets in this metropolis. The building was built and put into use in 1909 as a hotel whose original name was Hôtel de Ville. It was designed by Gardes, a famous French architecture. This building is thus one of the oldest, biggest and most beautiful French style buildings in Ho Chi Minh City, functioning both as a city institution and as the city’s most prominent landmark today. At first glance, it’s seen as a simple and beautiful old monument with 3 main buildings. Adding to the majestic ancient beauty of the building were the delicate bass-relieves on the walls, popular feature of French colonial style. Especially at night, the whole construction is spectacularly illuminated and looks beautiful like a castle in the dark. Anyone who has ever traveled to Ho Chi Minh City cannot take his eyes off the elegant architecture of the Saigon Opera House. Saigon Opera House, built in 1911, Opéra Garnier architectural form in Paris. The applied ornament, balustrades, cartouches, and roof were imported directly from France.Theatre has 900 seats due Harloy et Broger architectural design. Lying charmingly in the heart of the city, District 1 area, at the start of the famous Le Loi Avenue, the building still retails many lively evidences for the influence of French architecture in Vietnam. The Saigon Opera House becomes a theater for a variety of Vietnamese traditional and classical performances such as plays, concerts, ballet, opera, and Vietnamese traditional dance. 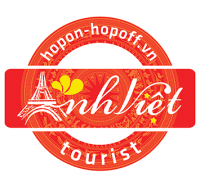 Moreover, this house – the brightest building of Ho Chi Minh city- is also one of the exciting destinations which visitors joining tours in Vietnam should not miss when visiting this city. The Opera House is surrounded by new shopping plazas and posh hotels, which allow tourists to combine the trip to the Opera House with a shopping tour. Nguyen Hue Walking Road is the most beautiful and largest road in Ho Chi Minh City with colorful decoration and modern water foutain system. This is considered the heart of District 1 road, very busy. Nguyen Hue walking Road runs from the People’s Committee Building of Ho Chi Minh City to the Saigon River. The present reconstruction reopened on 30 April 2015 for the 40th anniversary of the Reunification of Vietnam. A total rebuild makes it a pedestrian walking road. It has a length of 670 meters and a width of 64 meters. Flowers, trees, indirect lighting, statuary displays and a new Ho Chi Minh statue are the highlights. The area of President Ho Chi Minh Statue Park is set Uncle Ho’s copper alloy statue with the height of 7.2m, facing to Sai Gon River. To specify, all road surface and pavements are paved by natural stones with lines of lush green trees along two sides of road, art music water fountain system, underground control center, and public restrooms. Nguyen Hue Walking Street is the place to organize parades, meetings, street and flower festivals, exhibitions, culture and sports activities, art performances… of Ho Chi Minh City. On Nguyen Hue Walking Road, the fountain system automatically turns occasionally, pops up colorful movements. Many children run into the center of the walking zone to play and dance. The darker it is, the more people come to the walking road. Walking along Nguyen Hue Street, listening to long-lasting revolutionary songs of Vietnam bring a special feeling to both locals and tourists. The walking zone has two lanes for transportation circulation. In the center, it is the During TET, various flower exhibitions and displays are highlight the area. Ho Chi Minh is an opening and serene city. It is making its attempt to serve its residents with the best things. Also, the walking zone creates a new appearance for development of Ho Chi Minh tourism. This is also the location of the metro station will be completed in 2016.